Ben Vida is a Brooklyn based artist and composer who has released records with PAN, ALKU, Kranky, Thrill Jockey, Drag City and more. As both a solo artist and in collaboration, he has presented his work in the United States, Canada, the United Kingdom, Europe, Australia, South Korea and Japan. In 2013 Ben was Artist in Residence at Clocktower in Manhattan and Issue Project Room in Brooklyn. He performed at the Kitchen, NYC with David Behrman and help debut Tyondai Braxton’s new piece Hive at the Guggenheim, NYC. Ben presented a new solo work for electronics at theElectrónica en Abril festival in Madrid, Spain. His sound poem/audio work Tztztztzt Î Í Í … was published by Shelter Press to accompany his solo show Slipping Control at Audio Visual Arts, Manhattan. 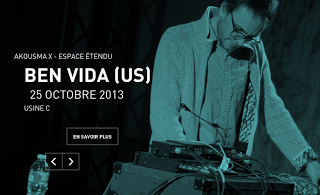 Ben Vida will present at AKOUSMA a new electronic composition for digital and analog synthesis.